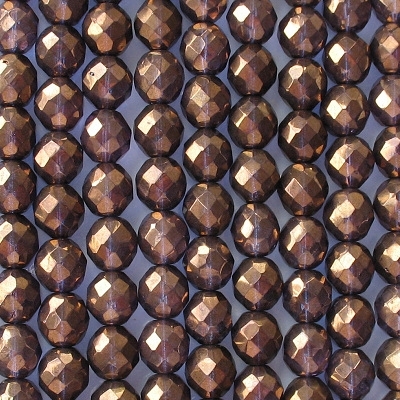 These beads have a heavy bronze-colored coating on the outside. When the light is bright, you can see a light-tanzanite purple color inside the beads. I believe, although I'm not sure, that the inner glass is actually colorless, but that the bronze coating refracts purple-colored light inside the bead. 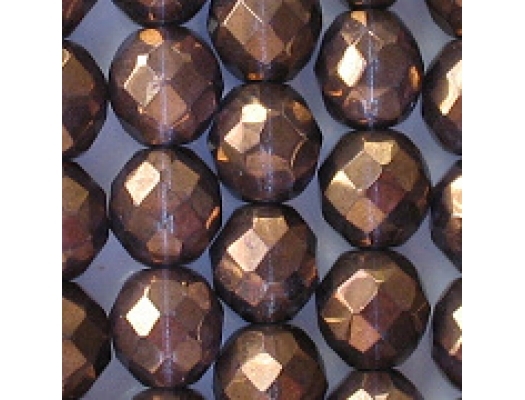 This effect can be seen with gold-coated beads which appear pink inside but are actually colorless. 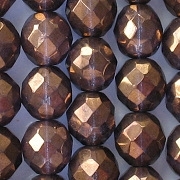 When the light is low, the beads appear very dark. When they are lying against something, like clothes, they also appear fairly dark. They are the lightest and brightest when they are held in the air. Of course, no one wears jewelry that way. The picture shows the way they look most of the time. These beads were quite expensive, and I gave them a lower markup than I usually give.